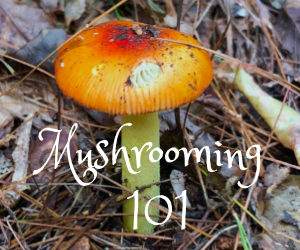 On Thursday, November 8th, Hendersonville Green Drinks welcomes Greg Carter, a local mushroom expert, for his talk entitled “Mushrooming 101: The world of Fungi according to the Fun Guy”. In 1999, Greg Carter learned how to inoculate oak logs with Shiitake spawn in an effort to make Christmas gifts to give family and friends. After several years of education, research and work making several hundred shiitake logs, his hobby “mushroomed” into a business. Greg opened his farm, Deep Woods Mushrooms, in 2006. His passion is to educate others of the medicinal properties of mushrooms and to encourage them to grow their own edible mushrooms on the hardwood logs of the Southern Appalachia. Greg now cultivates several varieties of edible and medicinal mushrooms, holds educational workshops and hunt classes, schedules farm tours and inoculation clinics, and offers dinners cooked in his wood fired pizza oven! You can find him at www.deepwoodsmushrooms.net or on Facebook. Drinks and a limited food menu will be available at Black Bear Coffee. Come at 5:30 to network and get your drinks before the talk at 6pm.